Provided charts are those that come with AstroConnexions when you purchase it. These charts are mainly from AstroDatabank. 2. Imported from Solar Fire or AC or from provided files on the AstroConnexions website. It is recommended that Your Charts database should hold your personal charts, imported charts and any chart that might require editing. Note that charts in the Provided Charts database cannot be edited (this does not affect their use in AstroConnexions in any other way). However, they can be copied to the Your Charts database where they can be edited. For example, the chart name or latitude can be changed. Note also that the Your Charts database is backed up to iCloud. Provided charts are usually AA Rodden rating so they won’t usually have to to be edited. 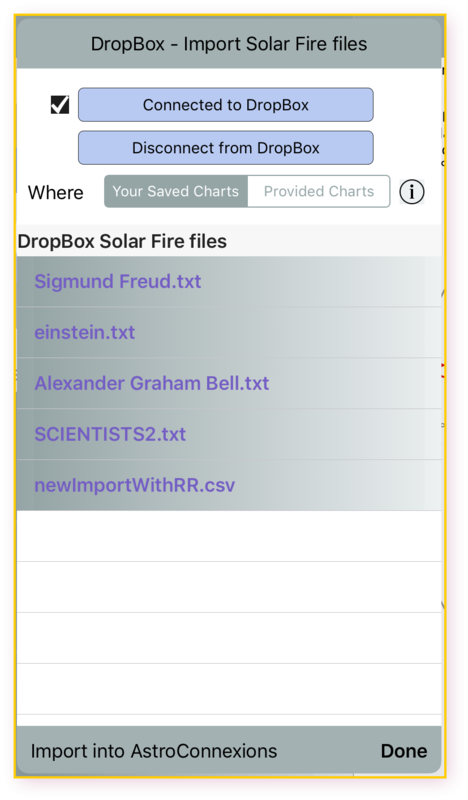 Charts saved/imported as Your Charts are backed up to iCloud automatically. Charts imported to Provided Charts are not.